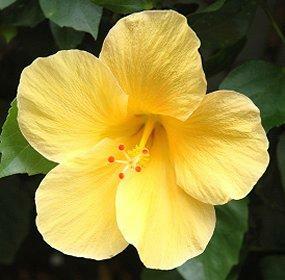 Hibiscus is Hawaii's official flower. For many couples, thinking of Hawaii conjures images of romantic tropical vacation proposals, beach weddings, or luxurious honeymoons, and Hawaiian engagement rings can encapsulate those images into a unique and meaningful symbol the couple will cherish throughout their relationship rather than just for one event. Hawaii is the youngest of the fifty United States, just admitted to the nation in 1959, but these stunning islands have rich cultural heritage going back centuries. The islands have always been popular tourist destinations, and their uniformly tropical, temperate climate is perfect for a relaxing romantic getaway. Today, Hawaii is one of the most popular locations for destination weddings, and many brides and grooms want to bring the luscious spirit of the islands into their ceremony. While lush flowers, pristine beaches, and powerfully beautiful volcanoes - perhaps all three silhouetted by a famous Hawaiian sunset - may create a wonderful tropical paradise for lovers and newlyweds, Hawaiian rings preserve that culture and symbolism no matter where the couple may eventually travel or live. Classic diamond solitaire engagement rings with delicate romantic accents such as curves to represent waves and beaches. Figural engagement rings that use Hawaiian designs, including palm trees, sandals, and sea turtles, typically with pave settings or channel settings to add diamond sparkle without focusing on a center stone. Whales or Dolphin engagement rings in a range of styles that symbolize the rich marine life around the islands. Flower engagement rings, particularly plumeria rings or hibiscus flowers. Hibiscus, in fact, is the state flower of Hawaii, making it all the more appropriate. Flower rings may be a single bloom, or a delicate three stone engagement ring can use multiple flowers. Engraved rings with Hawaiian accents, such as waves, bamboo, sea life, tropical flowers, or other symbols etched either inside or outside the ring. Rings with the couple's names in Hawaiian translation engraved or etched onto the bands. Pearl engagement rings, especially if the pearls are found right in Hawaii. Both white and black pearl engagement rings are popular choices. Inlaid engagement rings using popular gems with aquatic colors, such as mother of pearl, tanzanite, and aquamarine. Engagement rings using black diamonds that symbolize the exotic black sand beaches of Hawaii. In addition to this wide range of Hawaiian engagement ring styles, many rings are wide bands that can highlight more engraving and inlays, and the preferred metals are white gold, platinum, and titanium because they are delicately colored and will not overshadow the detail of the rings. Rose gold engagement rings, however, are also popular because their delicate coloration is complimentary to many Hawaiian styles. When are Hawaiian Rings Appropriate? Hawaiian engagement rings are appropriate choices for many couples. If either the bride or groom has Hawaiian ancestors, the ring can add a family connection to their relationship. A couple may meet in Hawaii, vacation there together, or be planning their wedding or honeymoon among the islands, and a Hawaiian-inspired ring will remind them of that connection long past the nuptials. A Hawaiian ring could even be a promise ring to represent a commitment to visit the islands together.Because many Hawaiian rings are non-traditional, however, a groom should understand the preferences of his bride-to-be before proposing. While she may love the allure and romance of the Hawaiian Islands, an authentic Hawaiian ring may not be the right choice for her, no matter how beautiful and symbolic it may be. 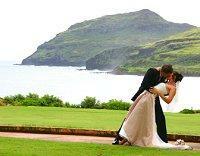 Couples that do choose Hawaiian engagement rings don't need to travel to Hawaii to find a beautiful selection. While island jewelers will certainly offer a great variety of designs, online jewelry stores can also provide beautiful Hawaiian jewelry. Na Hoku and GiftsHawaii.net, for example, both offer a superb selection of tropical Hawaiian rings. Hawaiian engagement rings are beautiful and highly symbolic options for couples whose relationship has a tropical connection. With unique designs and delicate details, these island-inspired rings are sure to bring tropical romance to any relationship, no matter where it may begin.